Take home modern, elegant style with our stripe bed and bedding set which features linens with a white-on-white mini stripe pattern. Included is the renowned Waldorf Astoria Bed, featuring our custom-designed hotel mattress and box spring. 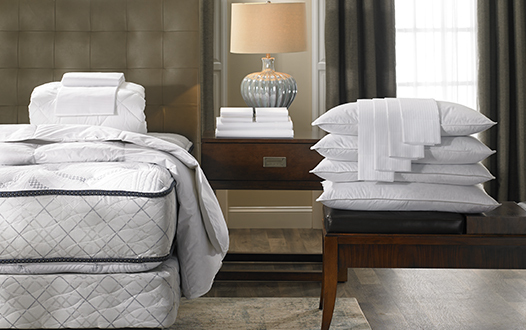 Dress your Waldorf Astoria Bed with this set which starts with the mattress topper, fitted sheet, flat sheet, down duvet comforter and cover. Add our four feather and down pillows, both firm and soft, with pillow protectors, cotton shams and pillowcases to complete your bedroom look. The pristine stripe look and crisp white linens are made of 100% Egyptian cotton sateen, the finest luxury for a great night sleep. Take home your memorable Waldorf Astoria hotel stay and recreate that experience right in your own home.